Enjoy beautiful views of the city while basking in the sunniest spot in San Francisco. Potrero Hill’s history dates back to around 1835 with a land grant by Don Francisco de Haro to graze Mission Dolores’s cattle at the potrero nuevo (“new pasture”). Gold rush squatters started pushing the herd aside and began the first of many waves of urbanization and immigration: Scots in the 1860s, then Irish, Chinese, Russians, Mexicans and finally African-American Southerners in the 1940s, building battleships at the bustling wartime shipyards. The soil in the hill is mostly serpentine. This is the best type of soil to ensure a solid foundation. The area survived the devastation of the 1906 Great Earthquake. Many displaced by the quake and lost their homes, moved to the Hill. Word of this safety got out, with several newspapers discussing how the Hill was the safest place to be if another quake erupted. So many moved to the Hill and set up temporary housing complexes. 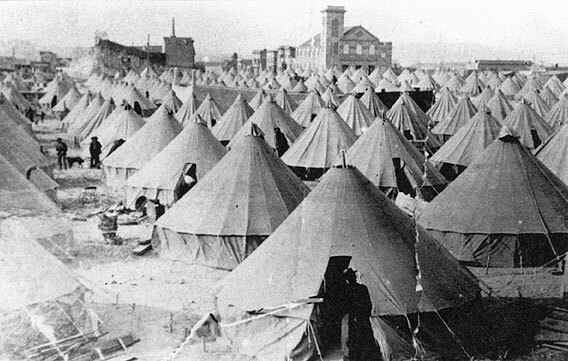 The Department of Lands and Buildings of the Relief Corporation built earthquake refugee cottages, or “shacks” to house refugees from the great earthquake. In all, 5,610 cottages were built to house over 16,000 San Franciscans in 11 different refugee camps. With real estate prices skyrocketing all over San Francisco it is only a matter of time before less desirable neighborhoods become gentrified and Potrero Hill is no different. With close proximity to SoMa and the Mission district, Potrero Hill’s residents changed from working class families to white collared professionals. While the north side is in the process of being gentrified, the south slope is still dominated by housing projects. But even that is being redeveloped.